Sunday 11 Our budget flight with Air Asia from Kuala Lumpur to Phuket worked out well. We were first to board, sat in the first row with a spare seat and were first off. If only all flights could be like that! We had paid for 'VIP transfers' in Phuket which turned out to be well worth the money. Having been first to depart the plane we were greeted by 2 people at the gate and escorted straight through the diplomatic/staff immigration channel. 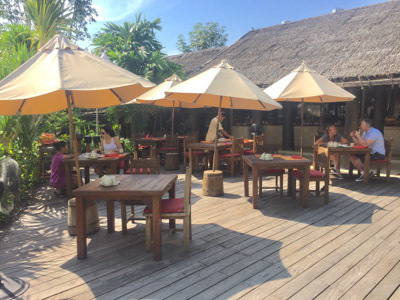 An E-class Mercedes whisked us from the airport to the marina where a speedboat transported us to Ko Yao Noi... no long queues at the airport and no 2 hour wait for a boat at the port! Even though it had been advertised as a 'Mercedes transfer' the cynic in me expected a Mercedes Sprinter minibus. I was very happy to have been proved wrong! Despite arriving at the Six Senses Report so early, our villa was ready for us, we were even able to enjoy our first holiday breakfast! 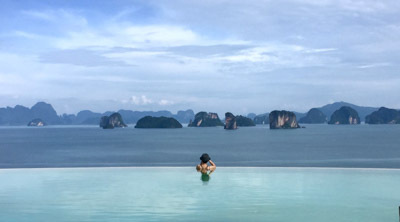 We spent time next to the Hilltop pool, enjoying the spectacular views of the islands in the bay. That evening we played a few hands of cards over a drink in the bar and ordered summer rolls a spicy tuna tartar which turned out to be mega spicy, even by our standards. 'Up in the Air' was being shown on the resort's beach cinema, unfortunately it appeared that the resort staff were not working to the schedule shown in our room, so we decided not to wait. Monday 12 We started off our holiday well with a 10km run for me and a cycle for Tammay. On the advice of our butler we headed south from the resort and enjoyed relatively flat terrain. We returned to the Hilltop pool and I managed to catch the sun a little! We had a 60 minute treatment at the spa. That evening we had a couple of drinks and a few more hands of cards in the bar. Tuesday 13 After breakfast we took the short Mangrove walk while enjoying a serving of ice cream. 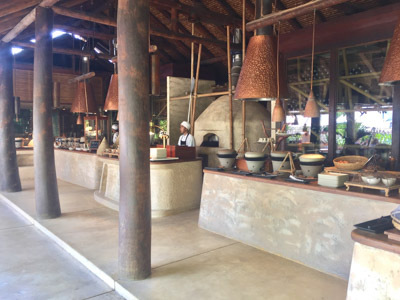 The resort's Deli Bar, with its free ice cream and cookies proved a popular stop for us - we typically called in 2 or 3 times each day! We returned to the spa for the sauna. That evening we played a few more hands of cards over a drink in the bar then went to the dining room for dinner - Pad Thai and a steamed prawn dish. Wednesday 14 I started the day with a 7.15km run. This time I headed north from the resort taking on the hills! We spent part of the afternoon on the resort's beach and I had a quick dip in the sea. We paid another visit to the spa for a session in the sauna and a 90 minute massages. We watched Avatar at the resort's beach cinema. Thursday 15 We started the day with another lazy morning next to the Hilltop pool. During the afternoon we spent some time in our villa's pool but could hear some building work taking place in the villa behind ours. 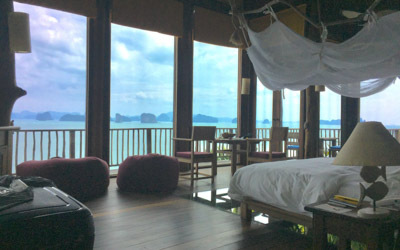 When we asked our butler about it she offered to move us to 'The View', a villa which unsurprisingly had a spectacular view over the islands in the bay. 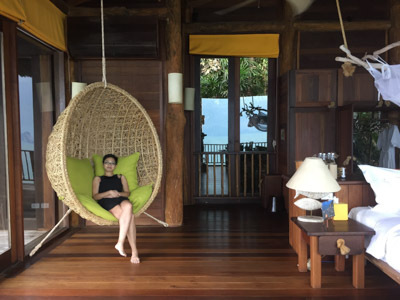 This villa was blissfully quiet! 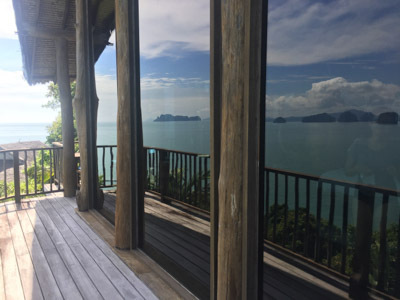 The islands in the bay reflecting in the windows of our new villa. That evening we stayed in our villa with some room service. After dark a thunderstorm moved in and we received the only rain of the holiday. Friday 16 Following breakfast we took a 2-man kayak to a small mangrove area in the next bay. The sky was particularly clear and the sun was hot. We spotted a small jellyfish passing our kayak and Tammay felt the need to harass it with our new GoPro. Less interesting spots were the plastic bottles and polystyrene blocks floating on the water - we couldn't help ourselves and started collecting them. We spent most of the afternoon at the Hilltop pool. That evening we stayed in the villa and watched a couple of 'girly films' - 'The Age of Adeline' (Tammay was very amused that I liked it!) and 'Finding Dory'. Saturday 17 I failed to get up for the sunrise run I had planned and instead lazed in bed! In hindsight I really should have made the effort and completed a full loop of the island. After breakfast Tammay was very excited to visit the goats that had just arrived on the resort's little farm. I had to reassure her that they were only there for their milk and goat wouldn't soon be appearing on the dinner menu! We spent the early afternoon in the villa. I actually spent some time sorting through the photos I'd taken in Namibia and South Africa earlier in the year! We spent our last few hours at the Hilltop pool. We paid another visit to the spa for a session in the sauna followed by another 90 minute massage. That evening we watched 'Star Wars - The Force Awakens' in our villa. 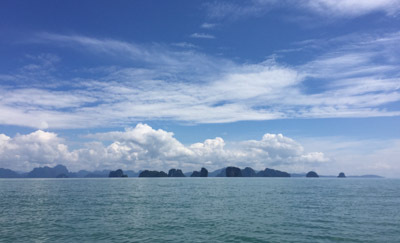 Sunday 18 A 06:30 start for our VIP transfers - a speedboat transfer back to Phuket, a 30 minute drive to the airport followed by an express service at the security and immigration counters. We flew back to Kuala Lumpur where we connected with a flight on to Denpasar, the capital of Bali.